The ACG’s San Francisco Chapter is one of the most active Chapters. The Chapter generally organizes lunch and evening events focused predominately on transatlantic relations and global affairs. The Chapter has a strong constituency in the Bay. 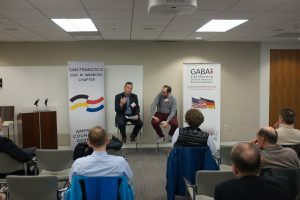 The Chapter partners with other local organizations such as the German Consulate, the German-American Business Association, the German American Chamber of Commerce, Goethe-Institut, the World Affairs Council of Northern California, and the Institute of European Studies IES at UC Berkeley. In 2017, the San Francisco Chapter hosted speakers such as Professor Christopher Schalast, Managing Partner at Schalast and Professor for Economic and European Law at the Frankfurt School of Finance and Management; Dr. Matt Beech, Director of the Centre for British Politics at University of Hull (UK) and Visiting Scholar at the Institute of European Studies at UC Berkeley; Max Grünig, President of the Ecoloic Institute US; Ambassador Thomas Matussek, Former Senior German Diplomat and Senior Advisor at Flint Global in Berlin; Dr. Sebastian Voigt, Postdoctoral Research Fellow at the Institute for Contemporary History Munich – Berlin; Dr. Jana Puglierin, Head of the Alfred von Oppenheim Center for European Policy Studies at the German Council on Foreign Relations (DGAP); and Juliane Schäuble, U.S. Correspondent for Der Tagesspiegel.